As part of her membership with the Governor’s Youth Commission, North Central teen Lauren Scardello was challenged to participate in Make A Difference Day, which is held annually across the country. The goal is to create projects that not only improve the lives of others, but also create real and long-lasting change in the community. 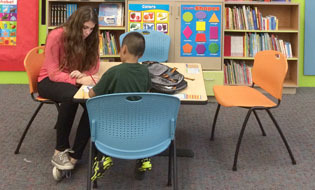 Lauren Scardello helps a child with his homework at the Saint Vincent de Paul Dream Center as part of her Make A Difference Day project (photo by Peter Scardello). You might think this would be a tall order for the 16-year-old junior at Xavier College Preparatory. But she set about creating a project, developing a wish list for that project, enlisting volunteers, contacting donors, and more. And in the end, she created a day of service that she and many others will never forget. Lauren chose the Saint Vincent de Paul Society (SVdP) as her agency to make a difference. SVdP’s Family Dining Room in south Phoenix ensures that families have a hot, nutritious meal each evening. “After the meal, parents have access to social services and support programs while children spend time in the Dream Center, one of the most important programs they offer at SVdP,” Lauren explained. “The goal in the Dream Center is to expose children to activities and experiences that perhaps aren’t available in their schools or at home and to strengthen academic skills that are critical to their future success. With the help of volunteers, they work on reading, math and science skills, art projects, music lessons and computer classes—with the goal to build important skills and relationships and to have fun,” she added. SVdP recently launched its Dreaming in Color Art Program in order to expose the children to real art and art supplies, giving them the opportunity to explore drawing and painting on canvas with pastels and watercolor—perhaps for the first time. Lauren’s Make A Difference Day project entailed helping to stock the supply closet for the Dreaming In Color Art Program. To that end, she held an art supply drive Oct. 1-21, using the Dream Center’s Wish List as a guide. The response was “more than I could have imagined,” Lauren said. Lauren had gathered 23 volunteers, ages 9-16 plus four adults, and together they went down to the Dream Center on Oct. 21 to help more than 75 children with their homework. Afterward the volunteers helped the children complete an art project celebrating the Day of the Dead by decorating Mexican sugar skulls.